The Rural Rambler: Ohio's Carbon Market - Coming to a Town Near You! Ohio's Carbon Market - Coming to a Town Near You! Woodland owners, Did you know that only 4% of private woods in Ohio are being managed? The Appalachian Carbon Partnership was designed to promote forest stewardship and link private woodland landowners to the emerging carbon offset markets. Rural Action's Sustainable Forestry Program is rolling out Ohio's new carbon trading program and will be presenting informational sessions throughout the region. During these presentations you will learn about program requirements and income potential from storing carbon in your trees. 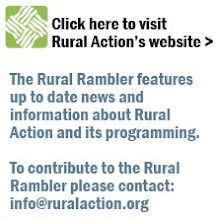 E-mail Susi Rankis at susi@ruralaction.org or call 740-767-4938 for details. You can also visit appalachiancarbonpartnership.org for more information.